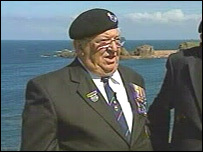 Scotland and Scottish servicemen played a vital part in the D-Day landings of 6 June, 1944. The WWII operation was one of the most ambitious and potentially dangerous military exercises ever undertaken. The Allies had to get a quarter of a million men across the Channel and onto the Normandy beaches in France. 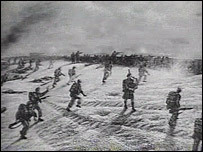 Planning and practice for the landings took place in Scotland and Scots were heavily involved as the battle moved inland. In the run-up to the Normandy invasion the Germans knew that the Allies were planning an attack, but they did not know where or when. Confusion and subterfuge were vital and Scotland participated in the deception. Operation Fortitude North implied that there was a 4th Allied Army in Scotland gathering near the Firth of Forth for an attack via Norway. In reality, there were no full-scale units. The illusion was created by lots of signal traffic sending false messages about mountain training exercises that never actually took place. Scotland was also a testing ground for the floating Mulberry harbours towed over to Normandy for the invasion. Most of the pier-heads were built by the firm of Alexander Findlay on Clydeside. The design was tried out at Garlieston on the Solway Firth and there is still a remnant of the harbour where a solitary tower stands in Wigtown Bay. Project inspecting engineer Tom Coughtrie said: "In eight months, we built two harbours, each the size of Dover, but it was done and done in time for the invasion." At Kirkcudbright, extensive armoured training areas and ranges based around Dundrennan were established by the War Office. Inverary was the centre for combined operations in amphibious warfare and seaborne landings were practised in Easter Ross around Fearn and in the Moray Firth near Findhorn, as well as at Arran, Loch Fyne and Scapa Flow. Loch Striven and Port Bannatyne Bay, off the Isle of Bute, were used for training crews with midget submarines in beach reconnaissance work. The Commando basic training centre was at Achnacarry and Roseneath, while Gareloch acted as the main base and for the US Navy. When 6 June came and the offensive was launched and Scottish servicemen were among the first to land on Sword Beach. 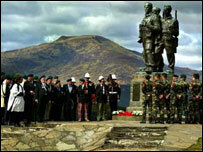 Lord Lovat led his commandos ashore to the skirl of the bagpipes. He asked piper Bill Millin to play to rally the troops' morale. Later the Germans claimed they did not shoot him because they thought he must be mad. On arrival, Lord Lovat is quoted as saying: "Pleased to meet you, old chap, sorry we're two-and-a-half minutes late." Meanwhile, elements from the 51st (Highland) Division landed on Juno Beach, where there was less opposition, however they went on to face fierce fighting later. Other Scots regiments then landed in the following days to back up the first wave. Once ashore, the Scots were vital in the battle to move inland. The 51st (Highland) Division and the 15th (Scottish) Division were involved in the prolonged fight to take the town of Caen. This was no easy task, with strong opposition from German Panzer divisions and the Allies faced heavy losses in fighting that went on until the end of July. D-Day marked the beginning of the end of the war in Europe and supported by aircraft and French resistance fighters the Allied forces were able to link up and establish a firm foothold in France. "If it was going to be the greatest invasion in history, it would be led by the pipes"